So your check engine light is on? Do not panic but dont ignore that light - especially if it is flashing. The light is your early warning system. Taccs Performance Auto Center offers a Check Engine Light Code Retrieval Service designed to provide the answers you need. Once the fault code is retrieved from your engines onboard computer, a professional Performance Auto Center technician will discuss your diagnostic options. The Check Engine Light Code Retrieval diagnostic services start as low as $49.99 although Free If the recommended repairs are completed at Performance Auto Center. Your #1 rated repair and maintenance garage in Elk Grove Illinois. Modern vehicles are equipped with onboard computers that monitor the critical systems in your car and warn you when something is going wrong. Your check engine light is your vehicle computers way of telling you that there may be a problem and your car requires service as soon as possible. This fault code is stored and can only be retrieved with specialized equipment that can communicate with your vehicles diagnostic system computer. The reasons for a check engine light activation range from something as simple as a loose gas cap to something as serious as a faulty cam shaft. 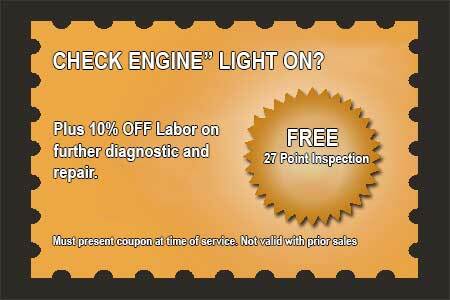 Below is a list of a few of the possible problems that could cause your check engine light to activate. These are just a few of the hundreds of causes and symptoms that would result in an engaged check engine light. Decoding your dashboard is a science and Taccs has the newest diagnostic equipment to determine your issue. A solid glowing check engine light could be indicating a problem that maybe a easy repair. Your vehicle could require a simple adjustment or a replacement part. Driving long distances with this light activated could result in a larger problem down the road. It is safest for you and your passengers to learn what is going on with your vehicle sooner rather than later so that you can take the necessary measures to fix the issue. If your check engine light is flashing, your onboard computer system is logging a potentially dangerous systems issue and you should not drive your car. Call Performance Auto Center at 847-891-7787 for Expert auto inspection in Elk Grove Village, Itasca Schaumburg.